There is a lot of talk about eating raw, whole food these days. Science aside, I don’t know of anyone who thinks that Americans should be eating more, cooked and processes food. Until recent years, raw food made up a large part of our diet. So my thinking is that anything that helps us get more raw food, especially raw whole vegetables, into our diet is a good thing. The thing that I love so much about raw, whole foods is not so much the reported health benefits (which I believe are significant, but still up for debate) but the fact that they take up space that would normally be filled by food that is not so good for you. You can only eat so much in a day, so any time you are filling up on healthy food, you are not eating fatty junk food. That’s a huge plus right there. So, no I don’t advocate a complete raw vegan diet, I think that’s an over kill and frankly too technical for most of us to maintain in a healthy fashion. 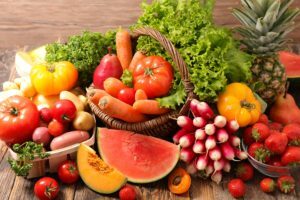 Getting all the required nutrients from a strictly raw and vegan diet is not easy and takes more thought and planning that many of us have time or energy for. But drinking a healthy smoothie every day is an awesome and easy way to get a ton of raw whole foods into your diet. Each raw, healthy smoothie I make has 10 to 12 servings of raw, whole fruits and vegetables – the amount many Americans eat in a whole week! Longer than that if you remove french fries as a vegetable. Do I think that raw foods are better for you than cooked foods? Yes I do, I agree with many whole claim that the heating process destroys enzymes and micro-nutients that are very good for us. But to be honest, there are scientists on both sides of this issue and very little transparency about who is funding whom. But if you replace a burger and fries dinner with a big healthy smoothie made from raw fruits and vegetables with no added sugar, that has got be good for your health.